Today, people all over the world are donning tartans and kilts to display the pride they have for their Scottish or Celtic heritage. The kilt, the most recognizable piece of Scottish national dress, can be dressed up or dressed down: it's not uncommon, for example, to see young men wearing t-shirts with their kilts at Highland Games or soccer events in which a Scottish team is playing. For more formal events, the kilt is worn with a Prince Charlie or Argyll style jacket. Traditional accessories include a sporran (a pouch that hangs from the waist on a chain or leather strap), a sgian dubh (a small, ornamental sheathed knife worn in the top of the right sock), and kilt hose (wollen socks turned down at the knee). Ghillie brogues, tongueless shoes with extra-long laces that wrap around the ankle, complete the ensemble. 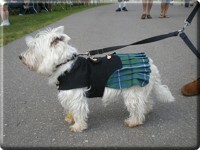 Scottish dress has made great inroads in military uniforms as well: certain regiments of the British Army and those of other Commonwealth nations still continue to wear kilts as part of dress or duty uniforms (although they have not been worn in combat since before the Second World War). 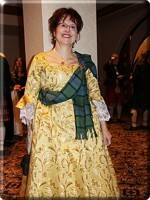 Scottish national dress has been much less defined for women. Traditionally, they wore the same clothing as their Irish or English counterparts, depending on their location and class. In the Victorian era, women could show their Scottish pride by donning a white ball dress with a silk tartan sash pinned at the shoulder. 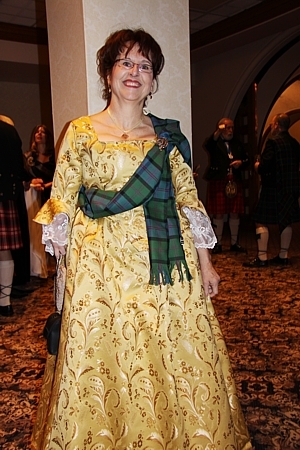 Wearing the tartan sash with normal attire remains a popular option for women today, as long as it is pinned on the right shoulder (only a chief, the wife of a chief, or a colonel or wife of a colonel of a Highland regiment may wear the sash pinned at her left. )!